Introduction to solid oxide fuel cells (SOFCs); Thermodynamics of the SOFC; Electronic properties of solids for SOFCs; Transport of charged particles in a SOFC; Oxide-ion electrolytes in SOFCs; Current, gas flow, utilization, and energy balance in a SOFC; Voltage losses in a SOFC; Direct current (DC) electrical efficiency and power of a SOFC; Performance characterization techniques for a SOFC and its components; Steam methane reforming and carbon formation in SOFCs; Poisoning of SOFC electrodes; Materials for SOFCs. High temperature solid oxide fuel cell (SOFC) technology is a promising power generation option that features high electrical efficiency and low emissions of environmentally polluting gases such as CO2, NOox and SOx. It is ideal for distributed stationary power generation applications where both high-efficiency electricity and high-quality heat are in strong demand. For the past few decades, SOFC technology has attracted intense worldwide R&D effort and, along with polymer electrolyte membrane fuel cell (PEMFC) technology, has undergone extensive commercialization development. This book presents a systematic and in-depth narrative of the technology from the perspective of fundamentals, providing comprehensive theoretical analysis and innovative characterization techniques for SOFC technology. The book initially deals with the basics and development of SOFC technology from cell materials to fundamental thermodynamics, electronic properties of solids and charged particle transport. This coverage is extended with a thorough analysis of such operational features as current flow and energy balance, and on to voltage losses and electrical efficiency. 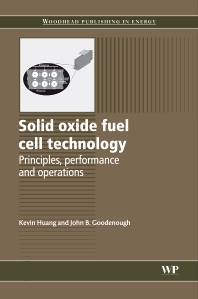 Furthermore, the book also covers the important issues of fuel cell stability and durability with chapters on performance characterization, fuel processing, and electrode poisoning. Finally, the book provides a comprehensive review for SOFC materials and fabrication techniques. A series of useful scientific appendices rounds off the book. Solid oxide fuel cell technology is a standard reference for all those researching this important field as well as those working in the power industry. Kevin Huang is a Fellow Engineer at Siemens Energy, Inc., USA. Dr John B. Goodenough holds the Virginia H. Cockrell Centennial Chair in Engineering at the University of Texas at Austin, USA. Both are noted for their research in the field of solid oxide fuel cells.